Was it worth going to Tibet? On our return journey to San Diego last week, we had about 24 hours in Beijing and less time in Tokyo. 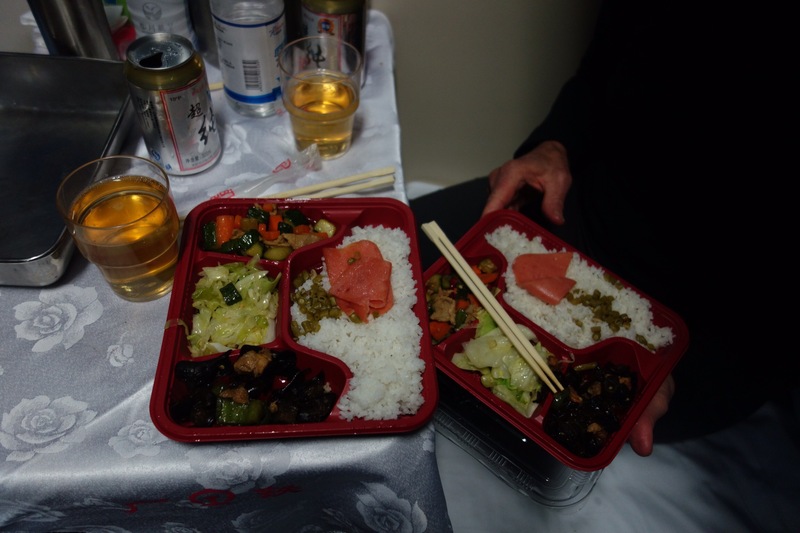 We did some fun things in each city and ate some good meals, but none of it merited blogging about. The larger question I never addressed, though, is whether it was worth returning to Tibet. Or more broadly: should anyone consider going there in the first place? Tibet has a number of strikes against it: mediocre food, complex and expensive Chinese travel regulations. The dry, oxygen-starved air makes any visit at best uncomfortable and at worst dangerous. Steve and I have an almost-religious devotion to never returning to most places. The world is too big and our appetite to see as much as possible of it too keen. Yet we went back to Tibet, and both of us felt good about that choice. The world has shrunk so much in our lifetimes. I can go online and within minutes figure out how to get to almost every point on the planet. But Tibet still isn’t that far removed from being a forbidden kingdom. A hundred years ago, no Western woman had ever set foot in Lhasa (the capital city). When Steve was born, there wasn’t a paved road in the entire country. No Tibetans lived with electricity or a car. Then the country was a theocracy, filled with monasteries that often were inhabited by thousands of monks, powerful men who pulled the most important levers within the society. If you travel, as we do, in part to glimpse different ways humans have lived throughout history, Lhasa still provides an extraordinary link with the medieval past. On our five-day road trip to Everest Base Camp, we visited an important monastery almost every day. All of them suffered terrible destruction in the years after the Chinese took over; things were particularly ghastly during the Cultural Revolution. The places we visited all have been at least partially rebuilt, though the resident monk population has shrunk severely. Tibet isn’t what it was 70 years ago. But it also isn’t like anything I’ve experienced anywhere else. The temples are gloomy, spooky places, still illuminated (at least in part) by yak-butter lamps. Statues of the Buddha (past, present, future!) and other deities tend to be big and baroque — the stuff of nightmares or dreams. For a country as poor as Tibet, it’s strange to see all the paper money, usually but not always the smallest bills, stuffed into every crevice of most temples. Believers think they gain spiritual merit by donating generously. The temples offer other head-spinning sites. The library off the main assembly hall of Sakya Monastery fills a narrow passage. It’s lined with shelves that ascend probably 35 or 40 feet up every wall. The shelves are crammed full of boxes containing centuries-old manuscripts. Our guide told us the pages on those manuscripts bear gold, silver, turquoise, and coral ornamentation. I could only begin to imagine all the man-hours, the man-lives, required to create them. I couldn’t imagine anyone ever again climbing up to the upper realms and retrieving one of the boxes and using the contents for anything. 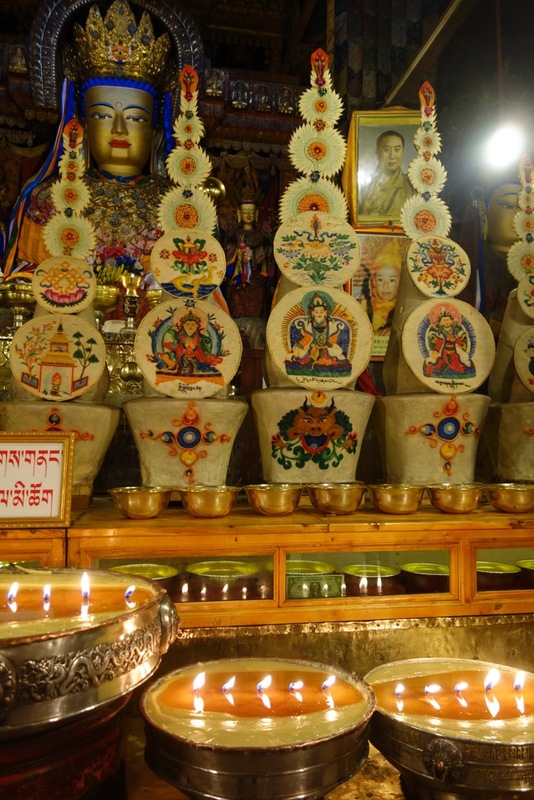 The yak butter candles illuminate sculptures made from yak butter. A handful of pilgrims shuffled through that passageway along with us, but most of them weren’t glancing upward but rather making their way to a huge old book on display in one corner. We passed several young couples who had brought their infant babies to it. Our guide said they believed blessings would result from touching the adult or juvenile head to the sacred volume. In the distance, we heard the periodic sound of a conch shell being blown. Pilgrims pay the monks to blow it. They believe it can enable the suffering souls of evil-doers who are trapped underneath the nearby hills to get a breath of air. Lighting butter lamps was a similar act of kindness, we were told. Doing so is thought to allow the subterranean sufferers to enjoy a brief glimmer of light. Not all the weird, exotic past is confined to the temples. On the road, we passed a hillside that’s still a site for so-called “sky burials.” In this Tibetan tradition, the dead person’s body is cut up and placed on the mountain-top for vultures to eat. (Really poor families also apparently use less expensive but similar “water burials,” while sick people whose bodies are diseased may be burned.) I questioned Tashi closely about this, and he insisted that sky burials are not a relic of the distant past, but rather the most common way most Tibetans still dispose of their dead today. Hundreds of pilgrims still shuffle all day long around Lhasa’s Jokhang Temple, the holiest site in all of Tibetan Buddhism. On this visit, we joined in that procession as we did last year and stared at those who believe they get spiritual credits by prostrating themselves fully on the ground, over and over. Religious pilgrims making the circuit around Jokhang Temple, with the Potala Palace visible in the distance. The strolling is pleasant, very different from the full prostrations done by some pilgrims. It’s a bizarre religious practice. More homey was the kora we joined in Shigatse, on our way home from Mt. Everest. In Tibetan Buddhism, a kora is the practice of walking (“circumambulating”) around a sacred site or object – commonly a special mountain or lake or a temple or religious tower. Again, believers think they accrue merit by this, but I found it pleasantly relaxing and social to join in the group stroll around the great Tashilumpo Monastery near sunset. From the high point on the path, we caught had great views of the magnificent temple below. Most of the folks walking around the monastery were older. In contrast, teenagers were at the heart of another sight that almost by itself seemed to make our long demanding journey to Tibet worthwhile. At Samye, the country’s first monastery, we watched a large group of girls and boys working to restore a rooftop built in the traditional method. The monks mix special clay and small stones and pebbles then spread the mixture on the room or floor. Workers then must pound the mixture to make it strong. We were told that the kids doing this work were no longer in school and being paid something for their labor. We didn’t ask how much. Clearly this sort of work was another relic from another time long ago. If I were being reborn a girl in Tibet today, I’d much prefer to come back as the 6-year-old daughter of the young couple in whose Lhasa home Steve and I dined on our last night. The “family kitchen” of the parents serves up tasty food at their dining room table. While we savored yak dumplings (steamed and fried) and stir-fried eggplant and green beans, the little girl and her friend sang along to songs on an iPad kitted out to be first-grader-friendly. It was easy to imagine that little girl learning English (and Mandarin), getting educated, growing up to do something other than pounding the rooftop of a lonely monastery in the middle of nowhere. I hope that happens. At the same time, I’m grateful to have had a glimpse into the fast-disappearing world in which she was born. The highest railroad in the world used to run through the Andes east of Quito, Ecuador. I first heard about it when I read the great rail-traveler Paul Theroux’s chronicle of taking trains through South America (The Old Patagonian Express). Theroux’s description of the distress suffered by him and his fellow passengers as a result of the altitude was both hilarious and riveting. I had no desire to experience it. Yet early Saturday afternoon (Oct 29), Steve and I pulled out of Lhasa’s main station on the rail line that knocked the Ecuadorian train out of first place. The line connecting Lhasa with Golmud in China’s Qinghai province (and thus the rest of China) opened in July of 2006. Costing $4.2 billion, it was said to be an engineering wonder, designed to stay safe and strong through some 340 miles of permafrost. Many observers decried it as the final hammer that would enable the dominant Han Chinese culture to obliterate traditional Tibetan society. Indeed, since its inauguration, tens of thousands of Han have immigrated to Tibet, and millions now have vacationed there. Steve and I wanted to take the train from Lhasa eastward, both to experience one of the world’s most remarkable rail lines and to see a big swathe of China unfold through our windows. Rushing toward the train in Lhasa station. Don’t want to miss getting a space for our suitcases! The train has three fare classes. “Soft sleeper” tickets don’t cost much more than the next grade down, but the train has only a few such cars, and competition for the berths is fierce. Despite the beguiling name, the 4-person compartments offer little privacy. Picture two sets of narrow bunk beds packed into a very small room. The “hard sleepers” contain two additional bunks (6 beds total), so things are even more cramped. Your only choice is to be lying down (on your bed) or hanging out in the corridor. The third category are like any train seats. You sleep sitting up in them. Besides being crowded, those hard seat coaches were awfully smoky. In August, our Tibetan tour operator emailed the good news that he’d managed to secure seats in a soft-sleeper compartment for us. Since our guide Tashi had to meet another tour group Saturday morning, the tour-company owner (Woeser) picked us up at our hotel and accompanied us to Lhasa’s hulking train station, which was obviously designed with the Potala Palace in mind. Woeser shepherded us through the security checkpoint, including a body scan and pat-down. Then we said our good-byes and Steve and I headed for the waiting room. A clear announcement (in Mandarin and English) alerted us when it was time to board. The way the crowd surged aggressively toward the boarding gates also was a clue. The stampede puzzled us; all the seats were assigned. But once we got to our compartment, it was clear why it paid to be early. At first glance, the compartment looked cozy and inviting. Clean pillows and comforters were piled on the lower berths, and a pristine white table cloth covered the little counter holding a glass vase and (fake) red rose. But… where to stash our suitcases? No space for this seemed to have been provided. One of our compartment-mates, a serious young economics student who spoke pretty good English, carried only a small pack, but the fourth in our foursome was a larger guy lugging a bulky sky-blue suitcase. After some scrambling, we figured out that we could cram all three of the bags onto a shelf near the ceiling. Very close to 12:45, we eased out of the station, and settled in for our 33-hour journey. 1 pm — A cute young Chinese woman in the uniform of a railway worker takes our tickets and gives us plastic cards that we guess we’re supposed to guard. She also hands us two forms. Besides asking for the basics, they require us to confirm that we’re fit enough to tolerate altitudes of 3000 meters (about 9750 feet). This is strange. The highest pass crossed by the line (Tanggula) is more than 16,000 feet. I note the little boxes labeled “Oxygen Outlet” near the head of each bunk. Inside, there are two holes, but nowhere do we find any hoses to connect to them, hoses which reportedly pumped out oxygen in the line’s early days. At the foot of each bunk there’s also a sleek little TV screen, but these also don’t seem to work any more. 4 pm — Steve and I have been staring for hours at the vast and empty landscape north of Lhasa. Rugged snow-dusted hills rim close-cropped ochre grasslands that remind me of felt. We occasionally spot some lonely railroad workers, but the principal inhabitants of this grim country are yaks — so many that Steve thinks some must be wild. (I doubt that). 5:25 pm — We start seeing frost (or is it snow?) laced through the grass. Have we finally reached the permafrost? A huge mistake was our failure to bring a decent map of the country we’re passing through. We also have no train schedule. The only other Westerner we’ve seen on the train, a friendly young Dutch woman who’s on a 6-month-long backpacking adventure, has told us she’s getting off in the city of Xining around 10:15 Sunday morning. From such bits of information, we’re struggling to extrapolate our position. 6:15 p.m. — For lunch we ate sandwiches purchased in Lhasa, but we’ve resolved to use the train’s dining car as much as possible to see more social action. When we enter it, however, the sullen looking waitress pointedly ignores us. We plop down in an empty booth and wait to see what happens. “Is there chicken?” I counter. “For two. And beer?” This prompts him to scribble something on a piece of paper and to demand from us 50 yuan (about $7.40). That seems awfully cheap, and we soon find out why. We get only one dish consisting of small pieces of bony chicken and hot peppers, two bowls of rice, and two watery bowls of soup. No beers. After polishing off the meager fare, we supplement it with some beer and a can of Pringles purchased from a guy with a cart. But we’re feeling the altitude, and so we refrain from tucking into the Oreos we picked up in a Lhasa supermarket. 1 am — We turned off all the lights in the compartment shortly after 10, but I haven’t done much more than doze. The train has an unpleasant habit of lurching abruptly every now and then. A train derailment anywhere in the world would be a nightmare, but the thought of it happening in this desolate wasteland is enough to keep me from relaxing. There’s no way to tell if we’ve crossed the highest pass, but I look forward to getting it behind us. The dry heat on the night train has irritated my sinuses so much they’re all but blocking any intake of the already oxygen-depleted air. I feel breathless every time I roll over. Still, there’s no drama unfolding on this train to match what Theroux described in the Andes. Maybe that’s because everyone is already more or less acclimated from their time in Tibet. Climbing up from Beijing may be uglier. 7:10 am — I’m sitting on one of the jump seats in the corridor outside our compartment, happy to see the eastern sky begin to lighten at last. The imminent dawn reveals still more frozen wilderness. When I peek into the dining car, a few minutes later, I note that someone has hauled a piece of furniture to block admission. I also spot the toes of a railway worker asleep in one of the booths. 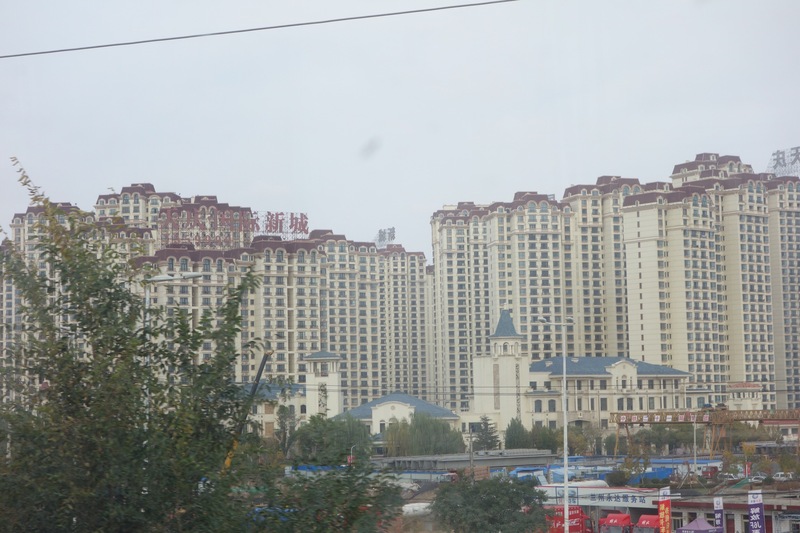 10 am — We reach the outskirts of Xining in Qinghai province, the first real city we’ve seen since Lhasa and a much bigger, smokier, more industrialized population center. At the big train station here, we’re surprised to see our two compartment-mates prepare to disembark. The nerdy English-speaking economics student tells us he’s switching to the train on the track across the platform. The guy with the big sky-blue suitcase is too. 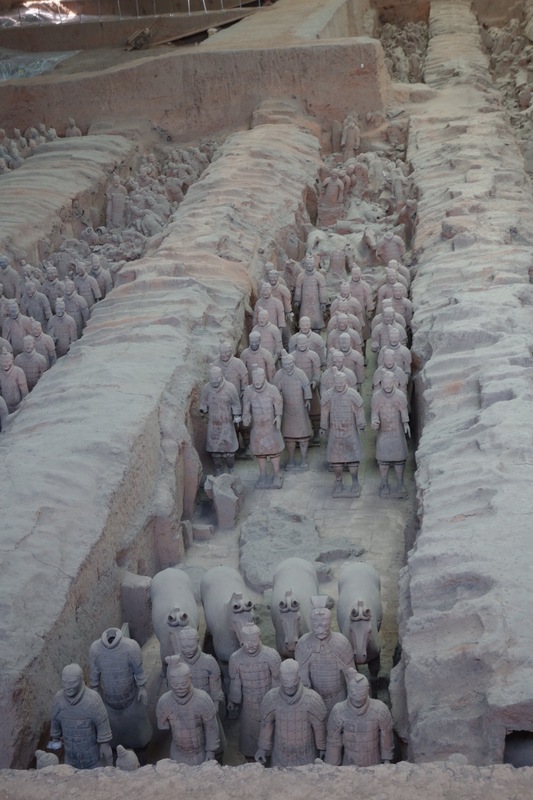 I dare to dream that Steve and I might have our compartment to ourselves for the remaining 12-hour-ride to Xi’an, where we’ll get off and head for a hotel so that Monday we can visit the tomb of the first emperor of China, with its famous army of terra cotta soldier statues. I head for the door to try to photograph the “Lhasa-Guangzhou” sign on our car. But the cute little train attendant, seeing me, starts shouting at me in Mandarin. She’s alarmed. Wait! She seems to be saying that Steve and I must also change to the other train! In a panic, we gather up all our stuff and cross the platform. In car #6, compartment 7 (the same one we had on the first train), we reunite with Sky-Blue and Economics Student. I don’t know why Woeser didn’t warn us that we would have to change, but all’s well. The new train doesn’t depart for several more minutes. And moving to the new quarters gives us an opportunity to extract the plastic cups we’d buried in our carry-ons. With them, we can get our daily java jolt. 12 — The new train has a fancier looking dining car. When Steve pokes his head in shortly after 11, he spies a quartet of young railway workers sitting in one of the booths, snapping the ends off big fat green beans piled high. No passengers were in the car then, but when we decide to seek lunch shortly after noon, every one of the 10 booths has filled up, except for one that has a “Reserved” sign on it. A tall handsome guy in some sort of a police uniform is sitting in it, and we observe him tell several other would-be diners that they may not join him. About 12:25, four higher-ranking officials in civilian clothes push in and take the booth. The dining car staff kowtows to them, serving up a variety of dishes immediately and several times offering extra rice. All this helps to distract me from how hungry I am. (Those breakfast pickles lack staying power.) We’ve grabbed a couple of stools and are determined to wait until the first shift of lunch patrons eats and leaves. At one point, a Chinese guys sits down in the remaining stool, and a waitress gruffly shows him the hand-written menu and takes his order. She ignores us. This irritates me. Finally one pair of lunch patrons departs and Steve and I charge up the car to claim the seats. I also come up with a plan for ordering. We inspect the three plates of leftovers on our table, and I snap a photo of the two that look best. The next time the surly waitress passes us, we all but physically restrain her and show her the photos on my phone. She gets it and even asks if we want rice to go with the two dishes. This time we pay 75 yuan (about $11). The food is delicious. On the right is tofu and pork. 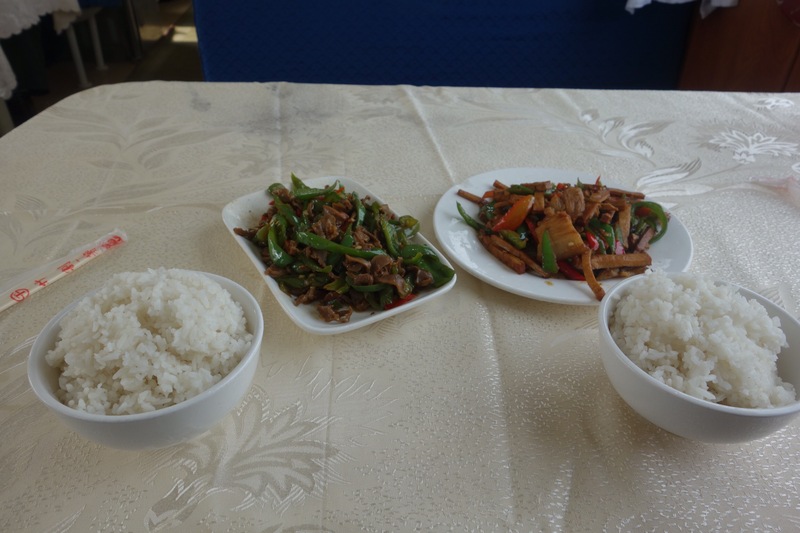 On the left, some of those excellent green beans cooked with a mystery meat. Whatever it was, it tasted good. Back in our compartment, we sip Starbucks instant, munch on Oreos, and breathe in air that already feels fuller and more satisfying (if polluted). 1:30 — We arrive in the ancient Silk Road city of Lanzhou, where Economics Student gets off. Lanzhou today is home to some 3.6 million residents. Xining has 2.2 million. Our destination for this night, Xi’an, has around 10 million residents. The chance to glimpse these huge cities that we’d never heard of before this trip is part of what attracted us to the ride. Lanzhou looks like a poster child for China’s environmental woes. The smokestacks and blast furnaces remind me of what the far south side of Chicago looked like in my youth.The smog is worse than it was in LA in when Steve was a kid. 5 pm — We’ve spent the last several hours staring at the muscular mountains of Gansu province. They frame huge valleys, every inch of which is farmed or occupied. Mysterious caves dot many hillsides. Every few minutes, we also see clusters of mind-bogglingly huge apartment buildings. They’re interspersed with more farms and at one point, a sea of greenhouses. 6:30 — Worn down by our earlier battles to get fed, we gamble that someone eventually show up with beer for sale (he does) and boxed dinners. They prove to be edible, if unexciting. The pink slabs appeared to be Spam. Not bad. 10 pm (Sunday) — I’m so ready to get off this train. The sun went down several hours earlier, and the train light that replaced it is wan and depressing. Our roommate, Turquoise Suitcase Guy, isn’t a bad fellow, but he’s spent the entire ride watching insipid Chinese TV shows on his Samsung smartphone, napping, or furtively munching on the contents of a large bag of junk food. 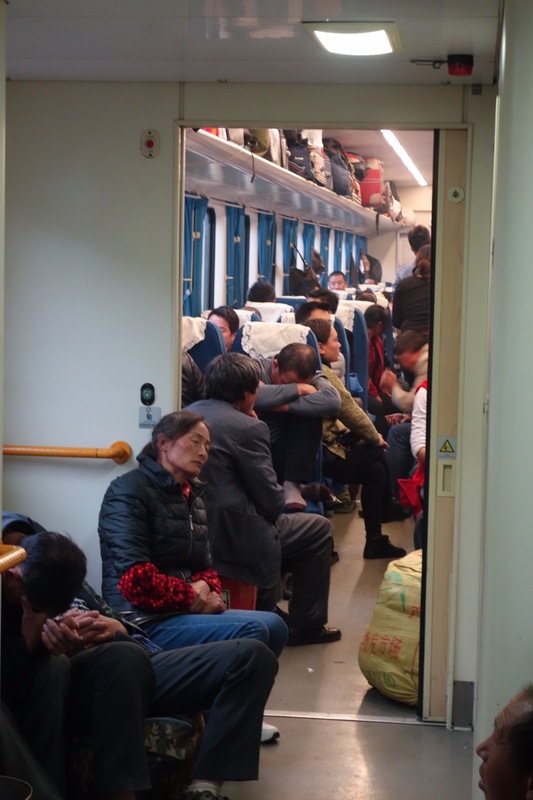 Although we were supposed to arrive in Xi’an at 9:47 pm, the train rumbles on and on past that hour. Eventually I begin to see huge buildings looming against a night sky that often seems to be tinged with dull red light. In my craving to reach our destination, the passing scene makes me think of Blade Runner. 7:30 am Tuesday — We’re feeling rested and happy after our day in Xi’an. 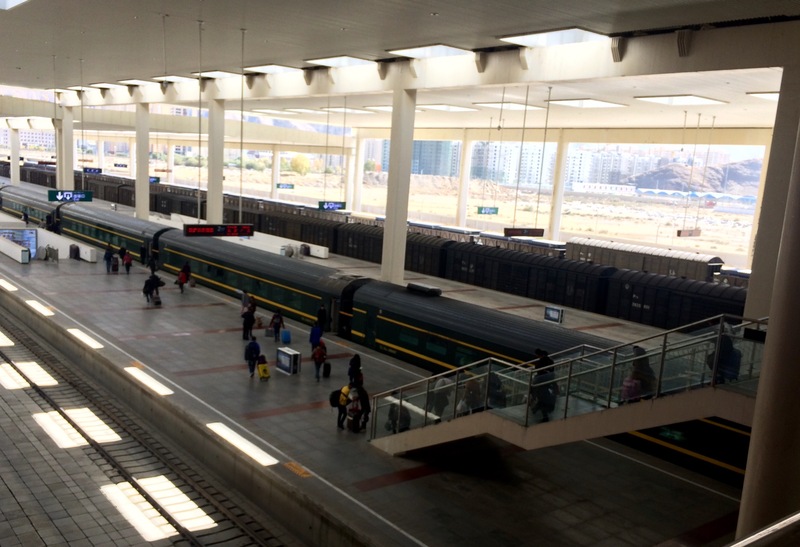 For our last train ride in China, we have to head to a different rail terminus in the northern section of the city. It’s just 5 years old, a gleaming vortex of high-speed rail lines that feels more like a fancy airport than a train station. 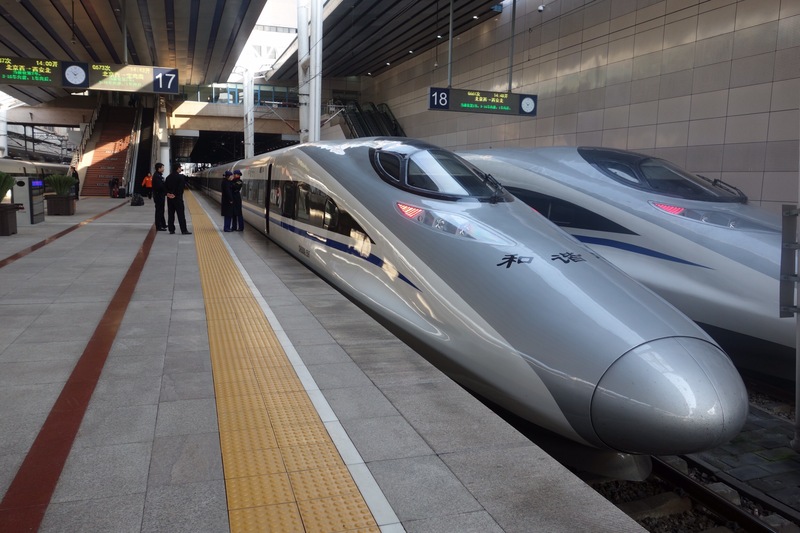 The high-speed trains seemed the equal of their peers in Europe. 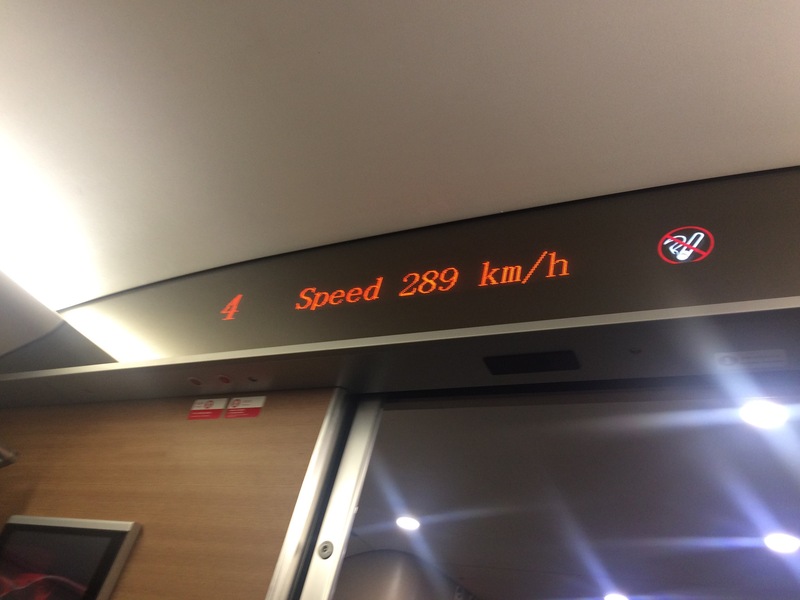 We find our boarding gate with plenty of time to spare, and settle into our second-class seats on the bullet train. It looks a lot like its counterparts in Europe, and soon we’re ramping up to speeds of about 180 miles an hour. 1:15 pm — The past four hours have borne us through mostly flat country. At least we think so. We can’t see more than a few miles out either side of the train. Beyond that, everything has disappeared in a murky fog that looks like some of the worst air pollution on the planet. Nonetheless, it’s an entertaining ride. For a while we speed along next to the enormous expanse of the Yellow River. We pass large tree-rimmed fields where all manner of crops are being grown. Some farms look as large as their American counterparts, except we spot within them something we’ve never seen in America: little mounds of earth and stones that obviously mark the graves of ancestors. As charming as that is, the thing that makes our jaw drop over and over are the massive apartment buildings — 20 and 30 stories tall grouped together in clusters of 8 or 12 of 20. We scarcely go more than 5 minutes before seeing another mob of them, all the way from Xi’an to Beijing. It’s another glimpse of the reality of sharing life with 1.3 billion fellow countrymen. Just one example of the hundreds and hundreds we saw while speeding along. On a morning in late March of 1974 (just a week or two after Steve and I were married), a farmer near the ancient Chinese capital of Xi’an was digging a well in search of water. He thought that the persimmon trees in the area suggested water might be present. While digging, he encountered some clay fragments. At first he thought they were remnants of an old pot, and thus potentially valuable, but he couldn’t discern any pot shape and the decoration suggested it was something else. Later digging unearthed a ceramic arm. Eventually, suspecting that the site might have archeological significance, he turned the fragments over to the cultural office of the local museum. Experts soon confirmed that Farmer Wang had found the first clues to one of the most important archeological treasure troves in human history — an as-yet-undiscovered part of the burial complex of China’s first emperor. 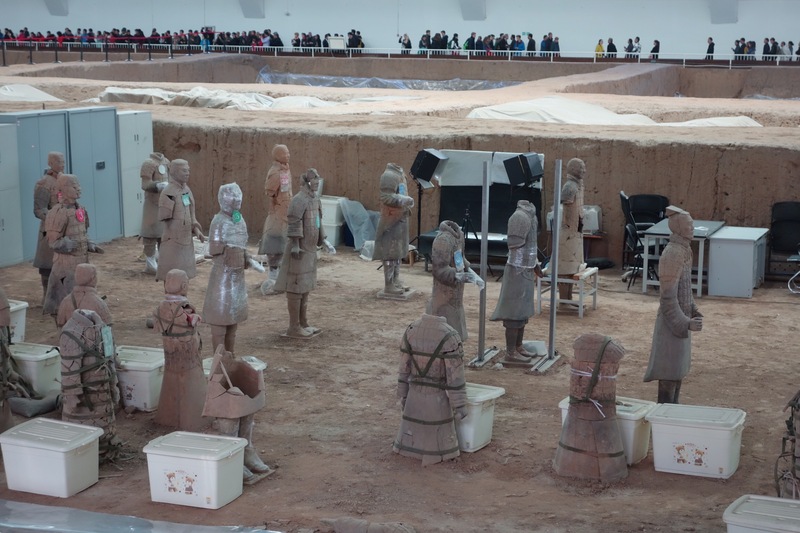 We went to Xi’an to see the incredible figures that have been exhumed and reassembled over the past 42 years. A huge amount of excavation and puzzle-solving remains to be done. These warriors are in the process of being painstakingly pieced together by archeologists. In addition to feeling intensely grateful for the opportunity to see them, we appreciated other turns of our good fortune. The guide that we hired to take us to and around the huge, impressive complex that’s been developed at the site told us it had been raining for the past week or more. Rain is rare in Xi’an, and it scoured the legendarily polluted air, so our outing took place under sunny, blue, and relatively smog-free skies. 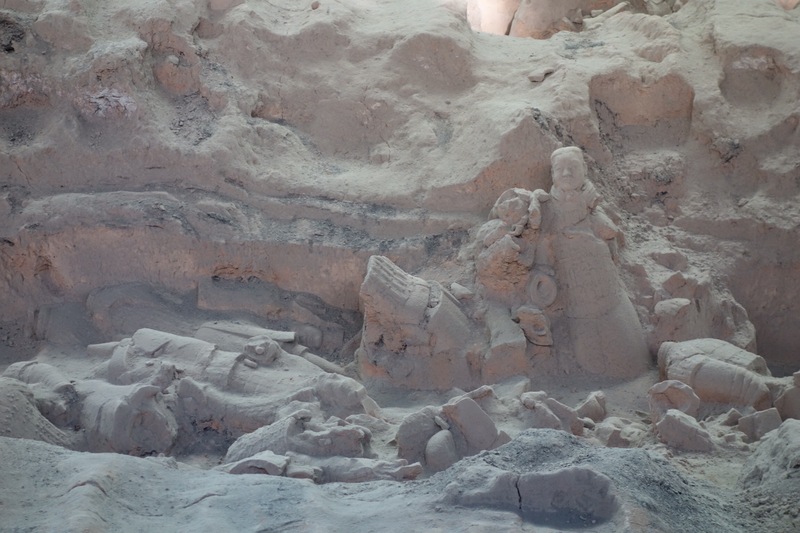 We learned that the the gigantic building that houses terra cotta horses and chariots would be closing to the public the very next day (so that the workers could continue excavating and reassembling them). Although 30,000, 50,000, even 100,000 Chinese tourists jam this space on days during the height of the season, the crowds were relatively light; we could see everything easily. 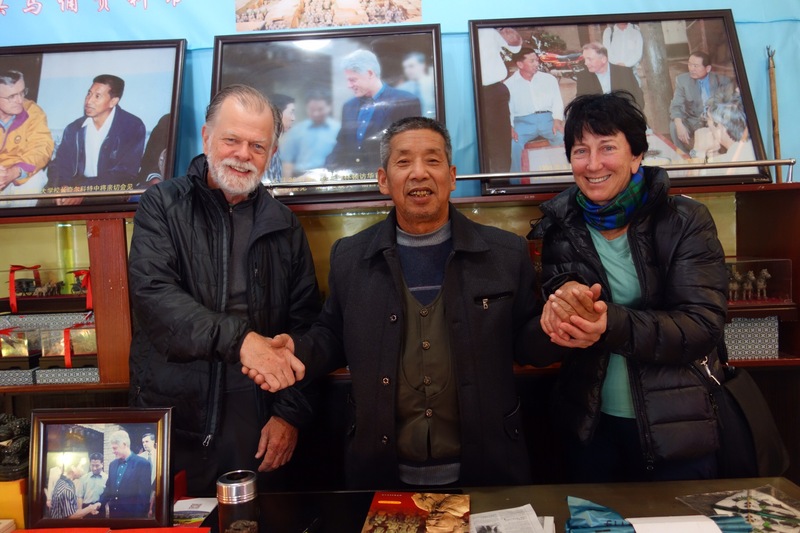 Perhaps our coolest stroke of luck was that we met… Farmer Wang! His digging days are long gone. He’s rich and famous, our guide said, and his family owns one of the fancy gift shops that have been erected on the complex grounds. He’s not there every day, but when we popped in, he was sitting at a table piled high with the book that bears his name. An assistant told us if we bought one of the book/postcard packages for 200 yuan (just under $30), Farmer Wang would autograph it and pose for a photo with us. Who could resist that?